Cyclists in the City: Southwark Council swings in to gear on cycling and local cycling group sets ultra-clear vision of what safe cycling in London should look like. Now the government needs to do likewise. Southwark Council swings in to gear on cycling and local cycling group sets ultra-clear vision of what safe cycling in London should look like. Now the government needs to do likewise. Early last week, the Department for Transport held a preliminary meeting to discuss issues around safer cycling. The AA, Sustrans, Cyclists Touring Club, British Cycling, London Cycling Campaign and others all turned up. I understand that no permanent staff from the Department itself actually attended and the Minister didn't so much as pop his head round the door. As one attendee put it (and I've spoken with several), 'it would have been nice to know there was a clear channel to the Minister but that seems to be lacking at the moment'. On the same day, the Department for Transport issued a press release about a 'satnav summit' it was holding. Clearly, England's road ministers had better things to do than sit and listen to cycling safety issues (Scotland and Wales and to an extent London have devolved responsibilities. In a way, you could say Boris Johnson is London's transport minister). There will be a follow-up meeting later this month. And let's hope that the DfT and the Minister actually pitch up and show some leadership next time. From what I understand, the meeting was very consensual. Just like a similar meeting the week before, where Labour's Shadow Transport Minister convened a cycling summit that included motoring, freight trade, cycling and other groups. The Labour summit was astonishingly consensual too. At least the Shadow minister bothered to turn up and she not only listened but she had clearly got her head around the issues. Another Labour administration has been on my mind lately, that of Southwark Council. A few weeks ago I honed in on Southwark's new cycling strategy. The plan, said the council, was to make all of its roads safer for cycling by lowering speed limits and 'integrating' people on bikes. 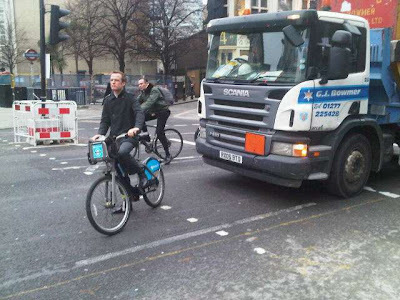 Pictured below is what happens when you 'integrate' people on bikes and people in HGVs. This isn't some place you'd let your child use a bike, I suspect. Southwark also set a cycling target that would have seen a reduction in the growth rate of cycling. Not a good strategy, in other words. And a shocking one at that, given the council's previously strong record on this sort of stuff. road infrastructure on their bikes? Last week, the leader of Southwark Council, Peter John, invited me to meet him and three of his senior colleagues. By the time I attended the meeting, it was already clear that the plan had changed. Southwark Council had already issued a press release in conjunction with Southwark Cyclists committing to the development of 'safe, cycle routes free of intimidatory traffic for those who travel across the borough by bike'. And that is exactly spot-on. Heavy, fast motor traffic is intimidating. It is the number one reason people think that cycling isn't a normal thing to do. A network of 'Green Routes' - ie routes along streets where speeds are slow and you don't feel threatened by motor vehicles. You can see the routes that Southwark Cyclists suggests here. What's clear to me is that Southwark's Labour council has realised that it does need to create a network of cycle routes across the borough. I think the best judge of Southwark's decision to invest in a proper cycle network will reflect this one statistic: The council says that 30% of its school children want to cycle to school but fewer than 3% of them do. The cycle network needs to be safe enough for those 30% of children who want to cycle to school to do so. Peter John told me in the meeting that he hadn't been on a bike for decades. He promised he'd get on two wheels and find out for himself what the borough's roads are like for cycling. And I very much hope he sticks to that promise. He subsequently talked at length with the local paid-for newspaper Southwark News. In what I can only describe as really high quality journalism, the latest edition of Southwark News examines the council's previous policy and its change of heart. 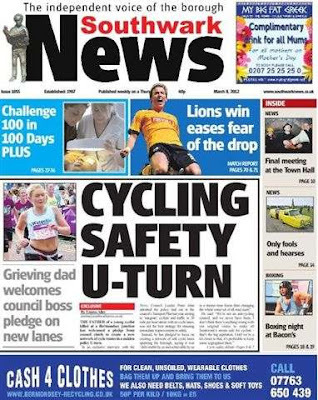 The newspaper points out that the council has only allocated £800,000 over three years to fund its cycling ambitions, out of a total £32 million for road transport. That number, says the paper, isn't good enough. They're right to draw that conclusion. As Southwark Cyclists points out, the council can afford to be more ambitious. In nearby Hackney, 4% of journeys are made by bike. Southwark's target is 5% by 2026. Hackney's aiming for 15% by 2030. I'm pleased that Southwark has realised where it was going wrong. I got the impression they really had taken the issues to heart and were starting to understand what they could do about them. But I also got the sense that this was an issue they didn't yet fully understand. Which is why, for example, only recently, dozens of people had to write in and protest that Southwark was planning to remove a cycle lane on Heygate Street (near Elephant) and make cycling here considerably worse. It has been very noticeable until now how far ahead the Lib Dem councillors in Southwark have been on cycling issues. You can read about how the LibDems view the issue here. Last night, local Lib Dem London Assembly Member Caroline Pidgeon and local LibDem councillors held a very well attended cycling safety summit. The Labour council has now got its head in the right place but has some catching up to do. My own view is that Southwark's management team will only really understand what it's like to cycle across the borough once they get out there and see what it's like for themselves. After all, it should be as easy as, well, riding a bike. I think Southwark's Labour leader has made a good effort at pressing the re-start button and it will be interesting to see how things develops over the coming months. Now all we need is the government to start following Southwark's lead and do something similar but on current evidence, I'm afraid that the government isn't really taking this safer cycling stuff very seriously yet. By the way, if you haven't done so already please add your name to the London Cycling Campaign's petition to the London Mayor: "I want the mayoral candidates to pledge to make London more liveable for everyone by making our streets as safe and inviting for cycling as they are in Holland" Click here http://lcc.org.uk/sign-go-dutch-petition Takes less than a minute. I ride regularly through Southwark, from Blackfriars Bridge to Bermondsey St, via Southwark St, Union St and Newcomen St. I get very mixed impressions. Firstly, there is quite a lot of 20mph limits on the minor streets, but often there is not the street architecture to make that limit stick, so cars and white vans hammer through at much higher speeds. There are a few notable separated cycle paths, notably to provide a contraflow on Union St towards Borough High St, but there isn't much else. In fact permeability is a real problem. In the warren of streets around Union St and Newcomen St, between Bermondsey St, Borough High St and Blackfriars Road, there are numerous streets which could accomodate a cycle contraflow, but don't. Navigating through this area along one-ways is quite confusing. Southwark Street itself is not very pleasant, but it has oceans of space which could easily accomodate proper separated cycle lanes instead of the intermittent on-road advisory crap which is there at the moment. It is TfL road so perhaps not really in Southwark's gift, but must be worth pressing TfL for. Finally, have you ever heard of this short quote from Galileo Galilei, the great astronomer? "Eppure si muove" - It still moves. Galileo is reported to have said this - under his breath - as he was acquitted of heresy by the ecclesiastical courts having publicly recanted his theory that the Earth goes around the Sun. I think we in London are (like with a lot of things in life and the world) mid table when it comes to this kind of thing. Yes the lack of infrastructure is appalling but when you compare us to other cities within the G8 such as Kyoto or Osaka we're almost like a cycling paradise. 1/ £4 million was revealed to be actually the pathetic £500,000 for actual infrastructure already committed in terrible Transport Plan. 2/ Cllr John's own Community Council rejected ALL cycle safety applications for money from its annual Cleaner Green Safer budget. 3/ The council's planning department rejected all calls for cycle lane and homezone inclusion for large regeration project in Cllr John's own community council area. 4/ They published revised Peckham & Nunhead Area Action Plan which deleted ALL the cycle routes that were in original draft consulted on before Christmas, despite ALL those who participated at a consultation meeting calling for more cycle routes. There is a mighty spin action going on by Southwark to counteract demonstrations by local cyclists angry about lack of action to create safe cycle-path network over last 20 years by all administrations.